School Holiday program activities, Melbourne, holiday entertainment Melbourne. 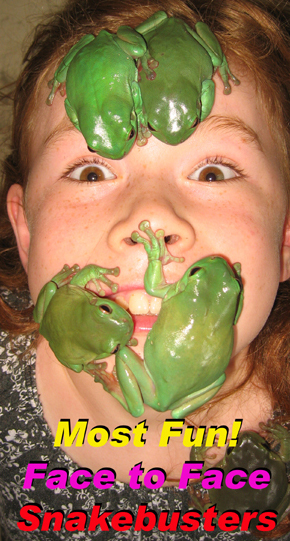 Snakebusters® Hands on reptiles ® trumps Everything! To book now call: (03) 9812 3322. Print out a one-page leaflet for School Holiday Programs. School holiday program activities need to be fun and live reptile shows are always popular with primary school-age children. Furthermore none are more fun than Snakebusters shows. For those who think all live reptile shows are the same, think again! No one else has the expertise and ability to impart information like Raymond Hoser and his team. The children are captivated and teachers and carers will be stunned at how he can have the undivided attention of a full group of young children for the hour or so his interactive show goes on. Several basic show formats are used and others can be formulated to suit the special needs of the group. The bulk of the show is the hands on reptiles® where the children get to hold various harmless snakes, large lizards, crocodiles or tortoises. By using multiple reptiles at once (something only snakebusters do), the children are usually able to touch or handle immediately, hence removing the risk of bored kids waiting for their turn. In fact Snakebusters are the ONLY reptile demonstrators in Victoria doing hands on with snakes, crocs and the like. For the other outfits it is either "show and tell" or touch a tail only. The “full-on-hands-on” is the most noticeable difference between Snakebusters and inferior reptile “shows”. Then there’s the other thing that puts Snakebusters ahead of the rest. This is the Snakebusters deadly snakes. Only Snakebusters have the world’s deadliest snakes and only Snakebusters can guarantee safety of everyone and the welfare of the snakes themselves! Our snakes have had their venom glands surgically removed (venomoid snakes) thereby removing risks to handlers and viewers alike and more importantly removing the need to traumatize the snakes by “tailing”, “necking” or stick handling as would otherwise be seen with deadly snakes. Hence ours are the only “snake safety” lessons which have the deadly snakes and are actually safe! Crocodiles? Yes, these come along too! They all come and yes, the kids can hold the lot! Then there’s the Snakebusters extras. These include things like reptiles performing for the kids and all while educating the children as to what different kinds can and can’t do. As for other shows, adults are also recommended to attend and while our preferred group size is about 30, there is some latitude here. While Snakebusters have long been regarded as the market leader in terms of live reptiles, people are always surprised that it rarely costs more to get the best. Pricing is from $300 per session (2014 prices) and less per session if several are booked at once. As a rule we try to keep pricing to about $5-$7 per child which represents unparalleled value for money. Please note that School Holidays are the busiest time for us and we squeeze the holiday program bookings in between Shopping mall gigs (yes most malls will only get the best, which means Snakebusters), Library programs and the like and while we try to accommodate as many holiday programs as we can, it’s not uncommon for us to have to pass up bookings due to already being booked out or date constraints. In other words, if you want Snakebusters for your holiday program, get onto us as soon as you can! Return to the Snakebusters website front page. School holiday program activities, Melbourne, Victoria, Australia, school holiday shows, Melbourne, Victoria, Australia, holiday program ideas Melbourne, activities ideas, Melbourne, Victoria, holiday entertainment Melbourne, Victoria, holiday education, Victoria, snakebusters are Melbourne, Victoria, Australia's most sought after holiday entertainment with reptiles, including snakes, crocodiles, lizards, tortoises or turtles and frogs, with most reptile hands on, most audience interaction with reptiles, best educational outcomes for reptile incursions and with the best reptiles displayed in Melbourne, Victoria. © 2009, Snakebusters, school holiday program activities Melbourne, Victoria and Australia, through active "hands on" education. All rights reserved. Kids holiday activities and shows Melbourne, school holiday activities, Melbourne, Victoria, Australia. ©2015 Snakebusters Reptile education shows and activities, school holiday activities Melbourne Victoria.